USModernist, the nonprofit educational archive hosting the world's largest website for mid-century Modernist houses, has curated a truly a once-in-a-lifetime opportunity to see some of the world's best architecture and the stunning natural beauty of Denmark, Sweden, and Norway - with virtually everything included! 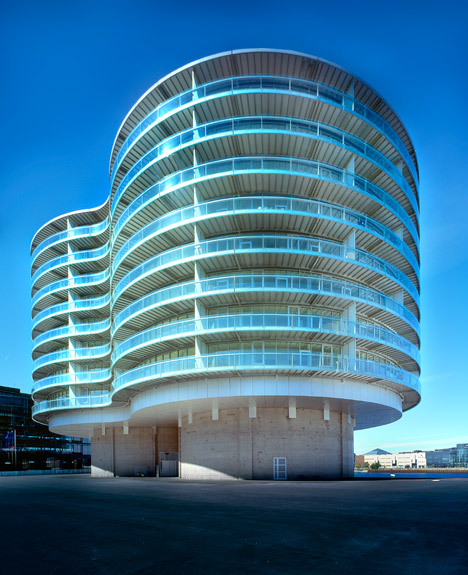 11 days and 10 nights of the heart-pounding Modernist architecture you love. You just won't believe where you're going and what you're going to see. Seriously, you won't! 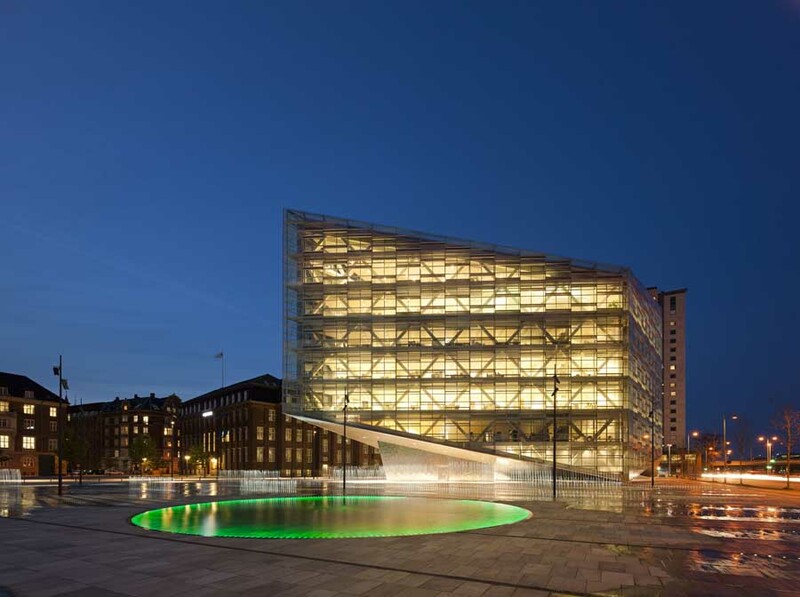 Did you know that Scandinavia is home to some of the world's best Modernist buildings? 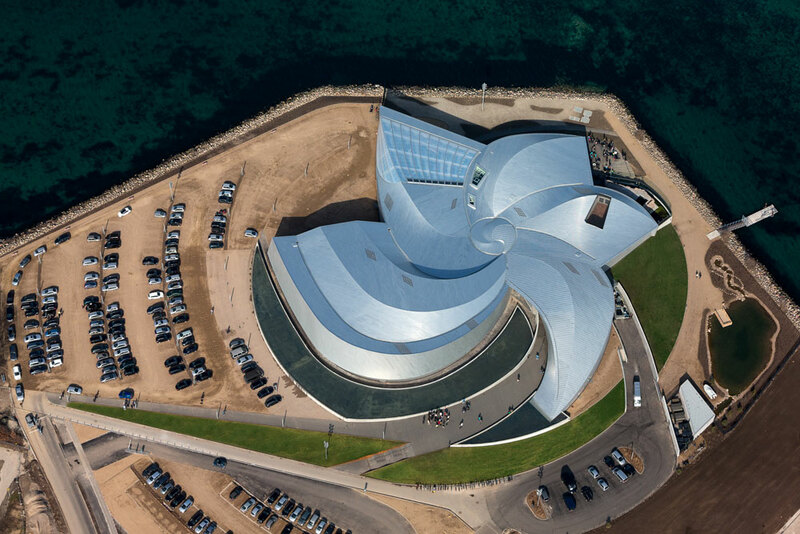 It's no secret that Danish, Swedish, and Norwegian design has influenced architectural style for the last century. 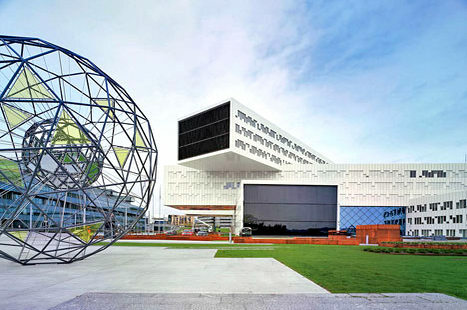 You will see - and visit - incredible architecture and furniture in three countries. Is the flight connection somewhere ghastly like Newark or JFK? No, you'll fly to Europe directly from RDU. Are breakfasts included? Yes, all of them. Hotels? Nice modern ones. Ground transportation? Of course, and all tours and admissions. Wow, that’s incredible! We think so, too. Roundtrip flight from RDU airport to Copenhagen via Paris on DELTA, plus a connector flight from Bergen to Copenhagen on SAS. Our own touring buses, with our own professional licensed guides leading customized architecture and design tours in English. Many buses have free wifi. 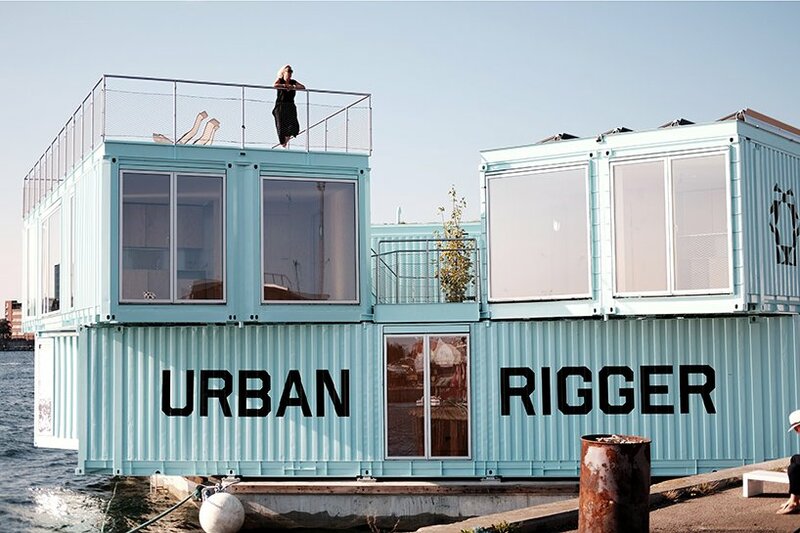 Your own three-day bus and subway pass around Copenhagen. Public transport is clean, efficient, and brilliant in Scandinavia. 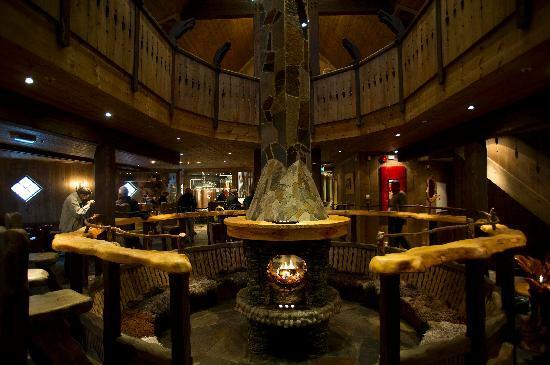 Modern, double-occupancy hotel rooms with breakfast and free internet. With the exceptions listed below, lunches and dinners are on your own. Special welcome and farewell dinners with wine or beer. Plus, each person gets a free year's membership in the Mod Squad/Terazzo Level ($125 value). Tuesday April 30 - Departure! 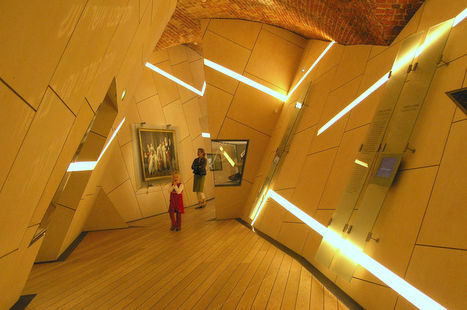 Fly DELTA Airlines and Air France to Copenhagen via Paris overnight. Wednesday May 1 - Arrival! You'll get a three day metro pass upon arrival. 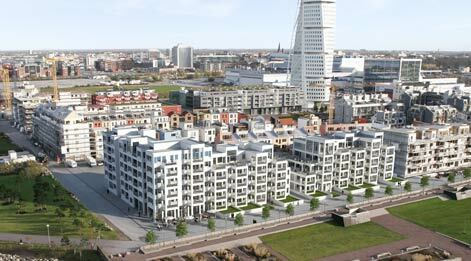 We step right on Copenhagen's metro and 20 minutes later walk a few blocks to our hotel, the centrally located Scandic Copenhagen. Relax in your cozy room or start exploring the charming city center on your own. 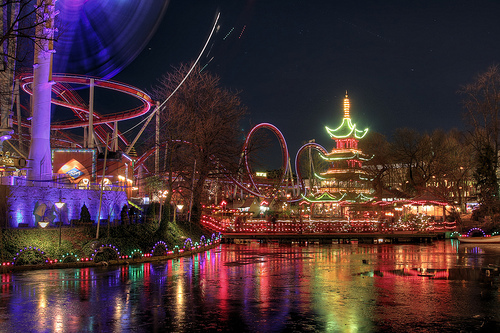 We recommend a visit to the world-famous Tivoli Gardens, an elegant old-world amusement park. 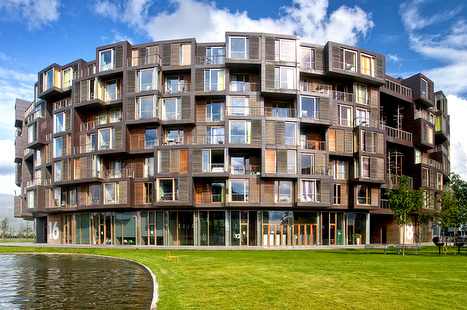 Our hotel, the Scandic Copenhagen. Enjoy our welcome dinner at the nearby rooftop restaurant, Illum, including wine and beer. It's the best view of the city! Thursday May 2 - Copenhagen! 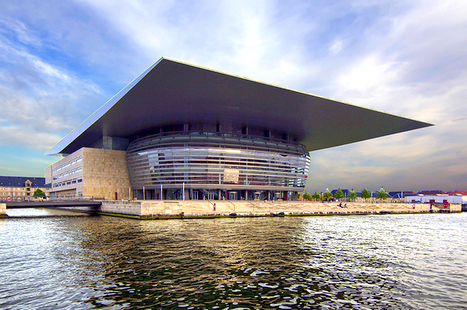 After breakfast, we visit the brilliant Copenhagen Opera House, attracting both opera and architecture lovers from all over the world. 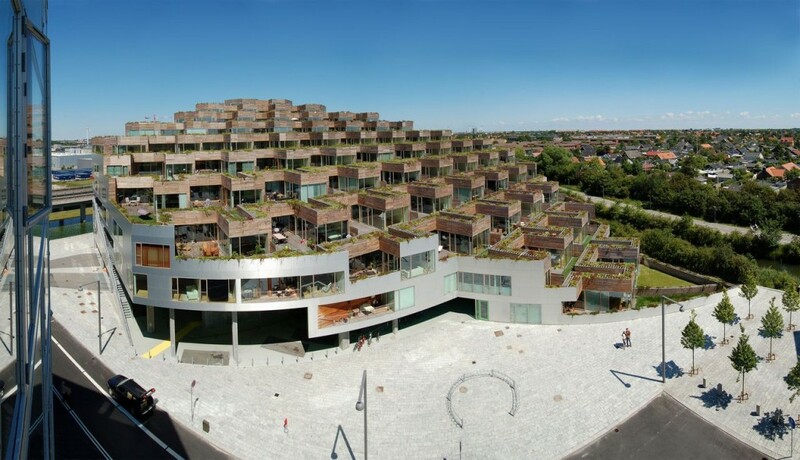 You'll also see buildings by the most famous architect from Denmark, Bjarke Ingels, including 8 House, VM Houses, Tietgenkollegiet, and Mountain Dwellings. Friday May 3 - Sweden and Malmo! 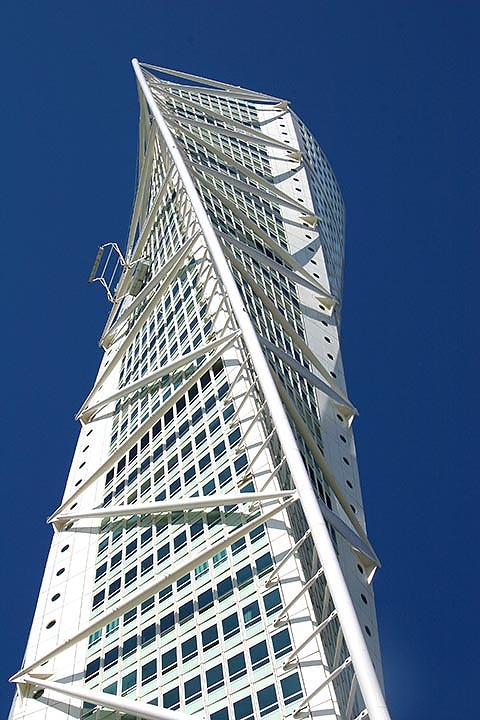 In the morning, after having a delicious breakfast, we go to Malmo, Sweden, to explore the Oresund Bridge and the Turning Torso by Calatrava. After lunch (on your own) we visit sites in Malmo including Moderna Museet, Malmo Triangeln station & University Hospital, Hyllie Water Tower, and Emporia shopping area. On the way home from Sweden, we'll visit the National Aquarium. 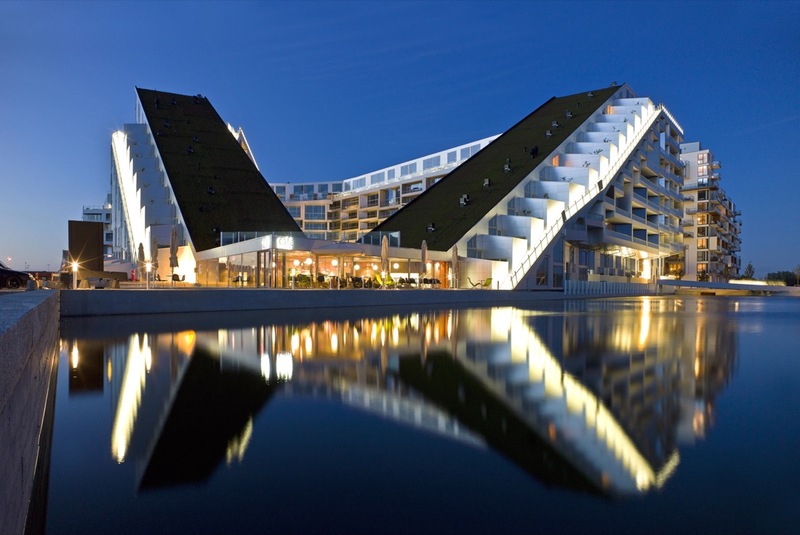 Saturday May 4 - Copenhagen Modern then Cruise! After breakfast we go for touring more great modern architecture: the Crystal Building, the Denmark Architecture Center, Frosilo, and the Black Diamond. 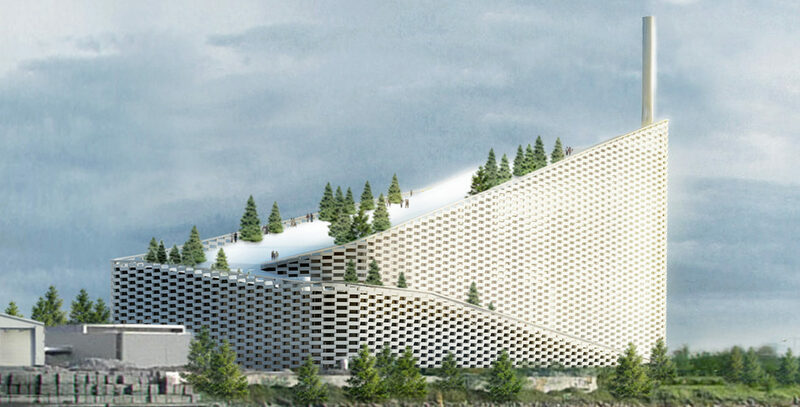 Then we'll go to more Bjarke Ingels projects such as Amager Bakke (a ski slope built on a power plant), Urban Rigger, and Superkillen. That afternoon we board a romantic overnight ferry to Oslo, Norway. Dinner is on your own on board from one of five restaurants. There's also a casino and a wellness area. 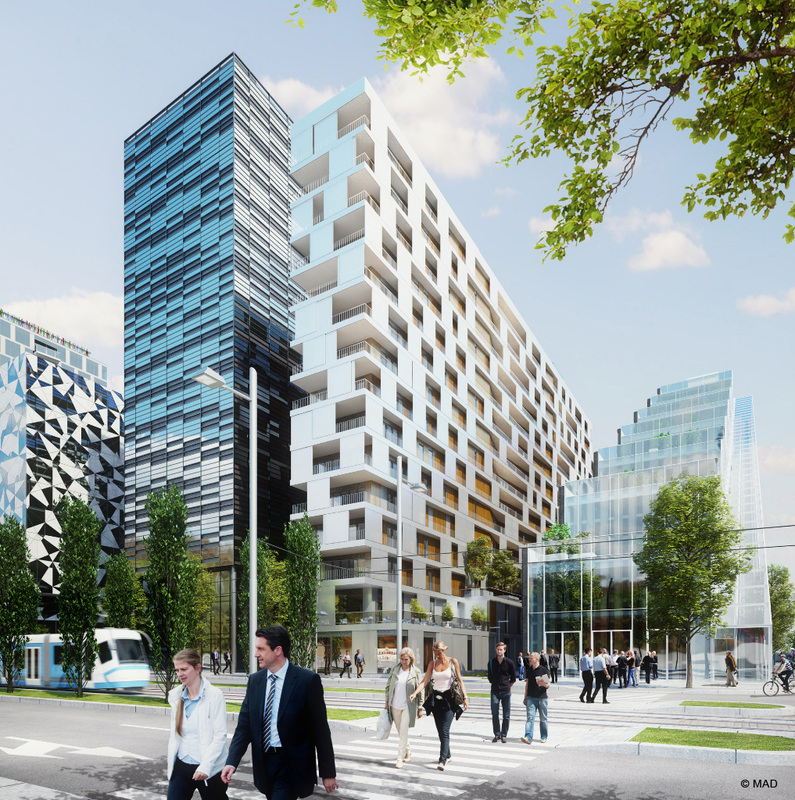 Sunday May 5 - Buildings of Oslo! 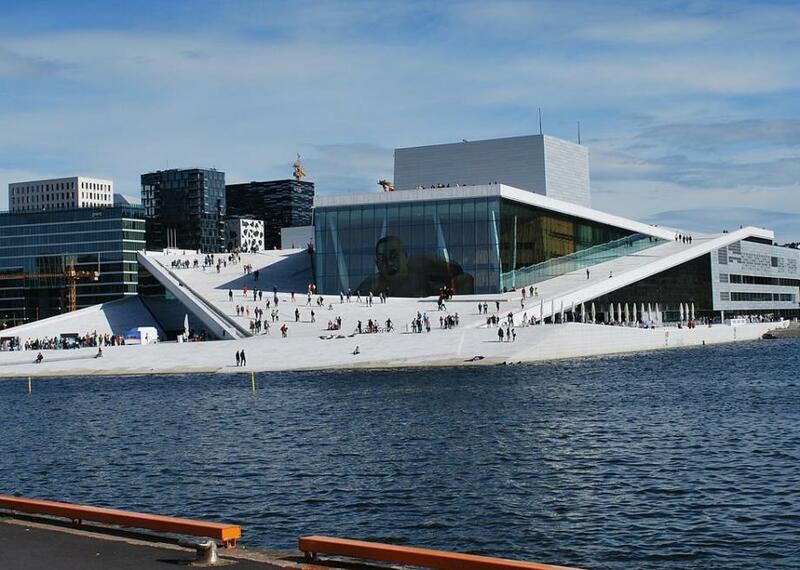 In the morning, after having a delicious breakfast on the ship (provided), we arrive in Oslo and start touring with Tjuvholmen then the MAD building in the Opera Quarter. 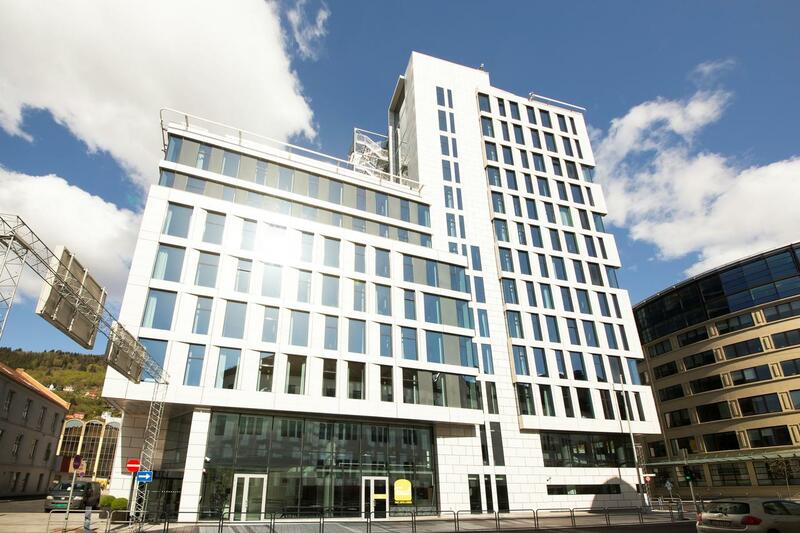 The tour ends at our hotel, the Clarion Hub, dead center of Oslo! The afternoon is free time for exploring the city. Lunch and dinner are on your own. 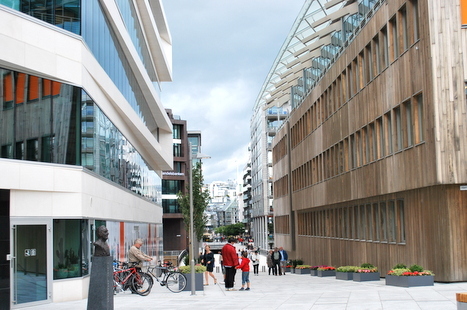 The newest Oslo's borough, Tjuvholmen, contains the highest concentration of intriguing outdoor design in the entire city. Monday May 6 - More Oslo! After breakfast, we see the new Oslo Opera House, Statoil Office building, and Westerdals School of Communication. 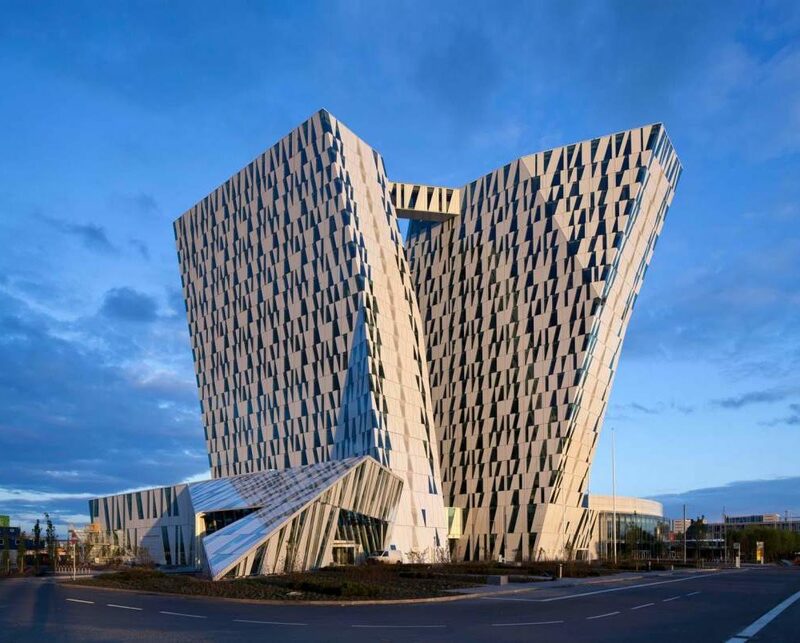 The Statoil Headquarters is considered one of the best office buildings in the world. 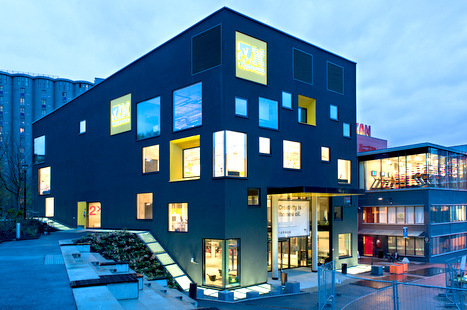 The Westerdals School of Communication is a a magically updated industrial area in Oslo. Tuesday May 7 - The Fjord Train! Following breakfast we walk across the street to the railway station for the scenic train to Myrdal into the mountains towards Bergen, then we connect to the world famous Flam Railway. Lunch is on your own en route, available on the train. 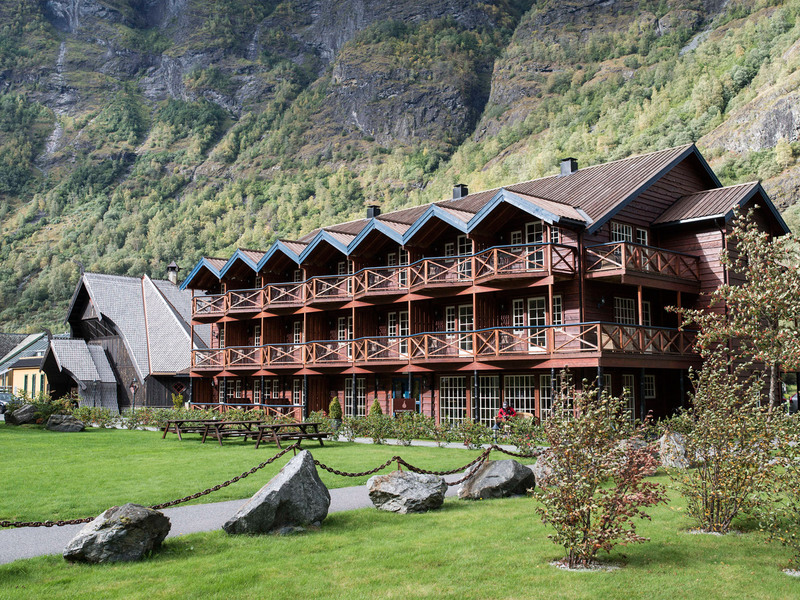 Upon arrival we are greeted and walk to the Aegir Hotel to rest and relax. 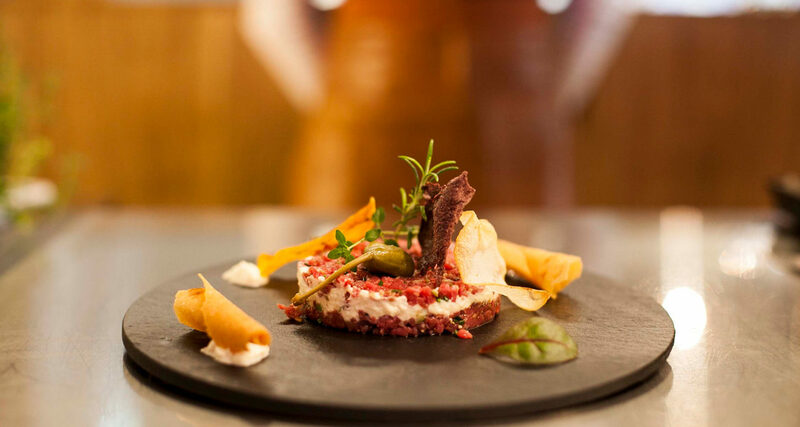 A group dinner that night at Aegir Brewery is included! You will have an unbelievable trip admiring the nature and picture-postcard scenery of Norway. 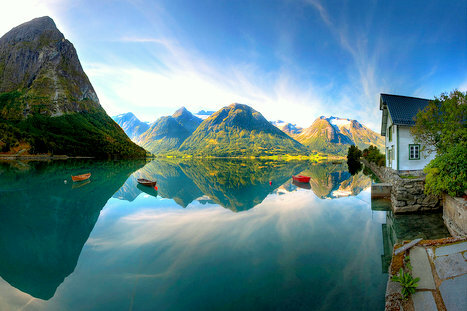 The fjords are the soul of Norway, considered the best preserved attraction on the UNESCO World Heritage List. 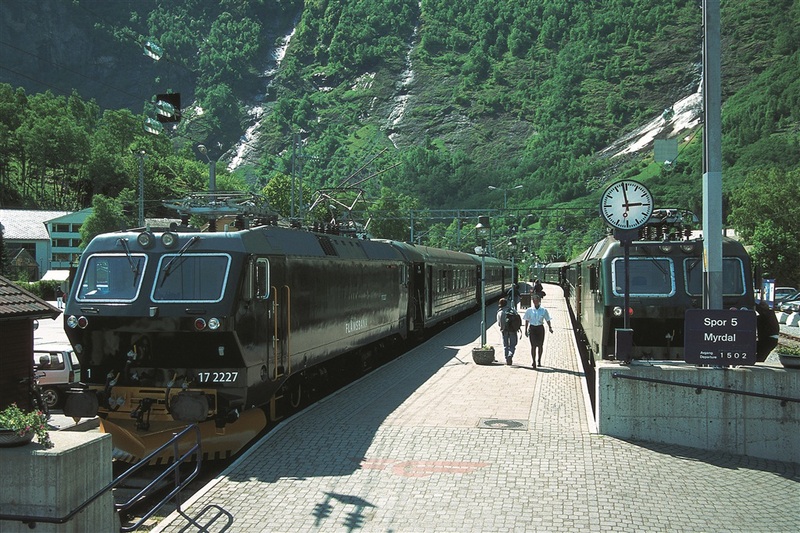 The Flam Railway is a spectacular train journey of Norway's magnificent nature and fjord landscape. The journey runs through 20 tunnels and 863 meters in altitude in the span of an hour. 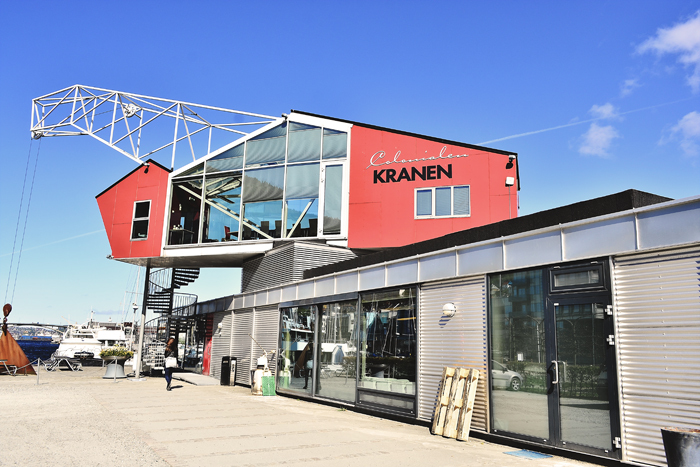 Wednesday May 8 - Onward to Bergen! After your morning breakfast we ride the train back up the mountain from Flam, then catch a high speed train to Bergen, arriving about 2pm. Pack a light lunch from the general store in Flam! Free time that afternoon and evening to explore the city. 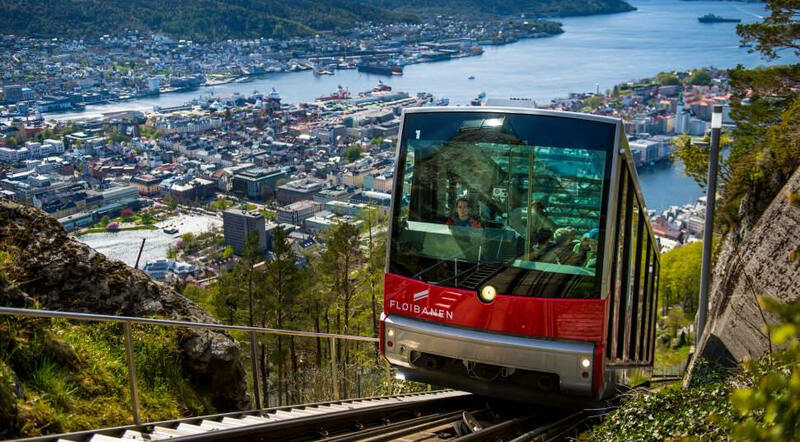 Following breakfast we go on thel Floibanen Mountain Train 1000 feet above sea level with amazing views over Bergen. Then we tour Bergen University College, Gronneviksoren student apartments, Norwegian School of Economics, the Documentation Center, and Kranen. That night, a special farewell dinner at the Bella Sky Hotel, where we will stay! At 3pm we take a short flight back to Copenhagen on SAS (included). Friday, May 10 - The Journey Home! After an early breakfast, we shuttle to the Copenhagen airport to fly Air France and DELTA via Paris to RDU. You will leave with fabulous memories, lots of photos, and a heart full of exciting Scandinavian architecture, wonderful people, and natural beauty! The trip requires a valid US passport expiring no earlier than May 10, 2020. There are no travel visas necessary. As we are on the move constantly, absolutely no checked baggage allowed. Yes, you will survive with one carry-on rollerboard/suitcase (maximum dimensions 9" x 14" x 22") and one personal bag / purse / laptop. You'll be fine. Really! However, if you buy a lot of stuff while we are travelling, not to worry. Carry a collapsible bag in your rollerboard. Checked baggage will be allowed on the flight home (you are responsible for baggage charges). Clothes to bring: Scandinavian climate is unpredictable and weather can be quite harsh even during summers. Bring a water-resistant jacket, umbrella, and warm clothes. May there is not like May here. Be prepared for sunny and chilly. Most tours are walking, so make sure to bring convenient walking shoes. Tipping etiquette: Tips in Scandinavia are not required or expected. Servers are paid well by the hour and tips in restaurants are voluntary. If you especially enjoyed the meal service provided, including a 5% tip would be considered generous. Language: Most Scandinavians speak perfect English and you won't have any language barrier. Staying over in Copenhagen: Once air tickets are issued, you may modify your tour to stay longer in Copenhagen or stop for a few days in London on the way back. This involves a change fee and any fare difference is handled directly with the airline. They are pretty good about this -- as long as you are changing dates and not cities. You may also add your frequent flyer number (or Global Entry number, if you have one). 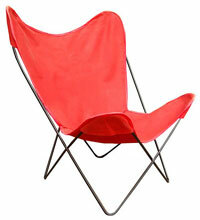 Proceeds benefit USModernist's ongoing documentation, preservation, and promotion projects. Questions? Contact Executive Director George Smart at (919)740.8407. Once payment is made, there are no refunds for any reason except for trip cancellation. However, you can transfer your place to another person with at least four weeks written notice to USModernist. All participants must sign a liability release in order to travel, as is standard with all USModernist trips. Parking at RDU airport is not included. The itinerary and order of trip events are subject to change without notice or refund. Sites sometimes change their minds at the last minute about granting access, in both directions yes and no, so you'll have to be flexible as we go along. There is a small but possible risk of overnight stay if flights are delayed, in which case participants are responsible for any additional costs of meals, lodging, transportation, and incidental expenses. The chances of this happening are small but it could happen.